“There is nothing – absolutely nothing – half so much worth doing as simply messing about in boats”, says Ratty in the opening scenes of Kenneth Grahame’s timeless and enchanting ‘Wind in The Willows’. 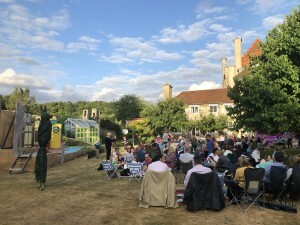 Well, I have to disagree: equally worth doing on a pleasant summer’s evening is to pop down to the delightful grounds of the Bishop of Winchester’s Gardens at Wolvesey Palace to catch the lovely team that is Chesil Theatre at work and play. Spread out a rug, pop open a bottle of something and munch on a picnic of sausage rolls, the odd bit of smoked salmon and home grown raspberries. Chesil’s biennial open air summer do at Wolvesey Castle has become a firm fixture now and a favourite for their audiences. 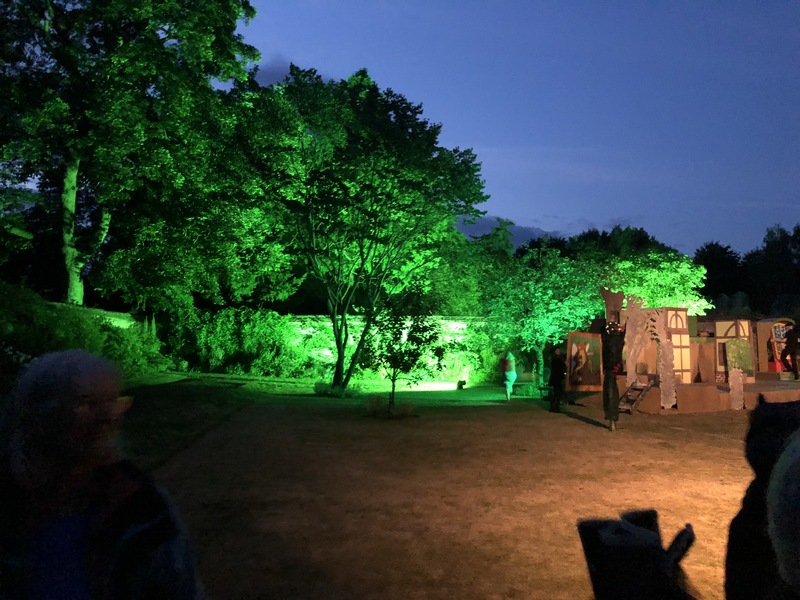 Two years ago they delighted audiences with their own adaptation of ‘Robin Hood’ and two years prior to that was the all-time outdoor swashbuckling favourite, ‘The Three Musketeers’. 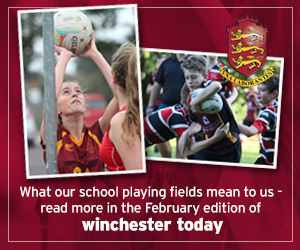 So no pressure then, to continue the tradition! 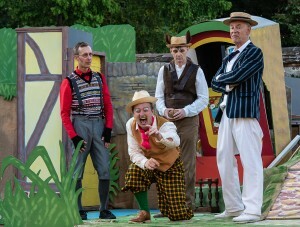 Steve Clark as Ratty brings facial expressions, gravitas and warmth to the role , especially when being ignored/sidelined by Peter Andrews, looking every inch the fearsome and blustery Badger (brilliant wig by the way, with the white stripe). Making up the foursome is Tez Cook as ‘good old’ Toad who keeps up that exhausting characterisation throughout and is able to keep a smile on your face all evening. Of course, you know full well what the immodest Toad is going to get up to – his fads and fascinations with boats, gypsy caravans, motor cars (inspiring Edwardian wireframe car by the way, one you can run inside!) and even trains, the run-ins with policemen, judges, washerwomen – but you cannot help but laugh at and admire the silliness and cheek of loveable Toad. Tez’s costumes, expressions and green eyeshadow are brilliant and largely carry the pace of the play that at other times feels a little flat and awkward. The set seems a bit over-engineered with somewhat distracting black-clad stage crew appearing in the middle of scenes to add unnecessary embellishments to depict different scenes. And that errant front door which is hinged on fresh air and keeps opening by itself threatens to upstage the whole show when in action! Some of the action is a little lost at ground level; anyone further back than the front row will probably miss the ducks down a-dabbling, up tails all as it is too low to be seen, which is a shame as it is well-choreographed and adds an authentic touch of Kenneth Grahame to the whole. 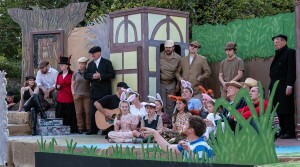 The junior cast of rabbits/mice/ducks works well, with two teams of six children alternating performances. They don’t just stand and look pretty, either – they have lines and songs and are very much part of the ensemble. They are the future Chesil leads, so why not indeed? 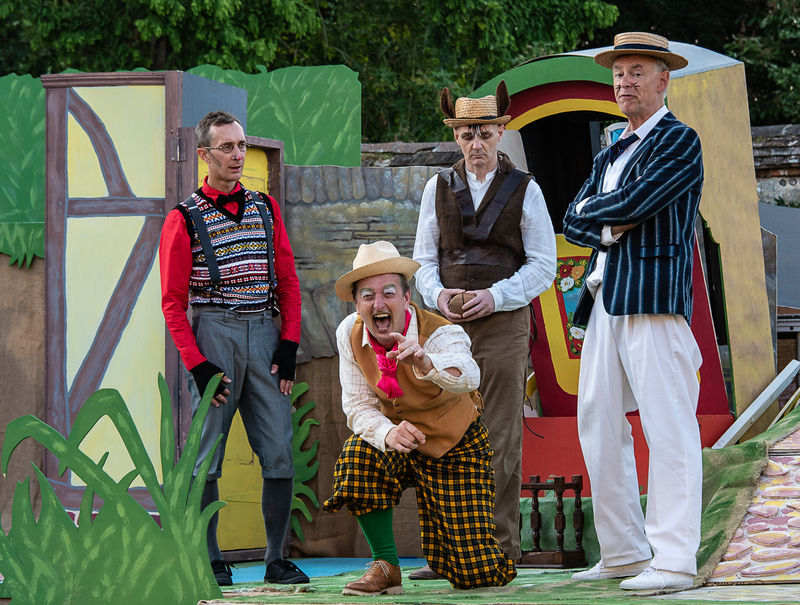 There are some great cameos, too – notably Charlie Seligman as the easily bribable judge and Malcolm Brown as the evil pinstripe-suited Chief Weasle whose occasional knuckle cracking brings more than a wince and audible gasp from the front row. There are more than a couple of rather modern Bennett-esque references in this adaptation which might have left the original author scratching his head: “it’s alright, policemen don’t hurt people” drew a couple of glances from people around me, the reference to washerwomen doing ‘big men’s smalls’ joins a load of other rather 21st century one-liners and (only the front few rows will see this) even Ratty’s boat manages to earn the name ‘Boaty McBoatface’ adding a nice touch.